I’ve been utilizing your marathon training programs for the last three years, most recently Intermediate 1 to complete my sixth at the California International Marathon with a PR of 8 minutes. My next marathon is not until late spring, my goal a BQ (Boston Qualifying) time. What should I do between now and the start of my next cycle in order to keep myself in a comfortable training zone, yet not feel like I’m starting all over again 18 weeks out. You have two options. The first (and easiest) would be to use this period between marathon training cycles for active rest. Continue to train, but without passion. Cut your miles in half. Substitute some cross-training. You should be able to maintain, if not improve, your fitness doing relatively little. Actually, I’ve known some runners who surprised themselves by setting PRs during a down cycle. The extra rest allowed them to benefit from all the hard training preceding that cycle. The second option (and perhaps the most logical one for someone seeking a PR) is to shift training focus, go from a concentration on endurance to a concentration on speed. 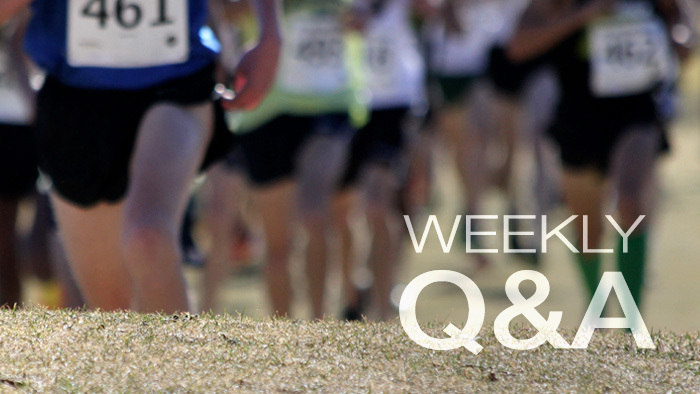 Select one of my 8-week programs leading to a race between 5-K and 10-K, whether or not you run such a race or not. Running fewer miles will allow you to run faster miles, maybe even do some speedwork. Eighteen weeks out, back to marathon training. That’s the logical route leading to a BQ.